The dead core of a once massive star is producing one of the most powerful magnetic fields ever recorded by scientists. 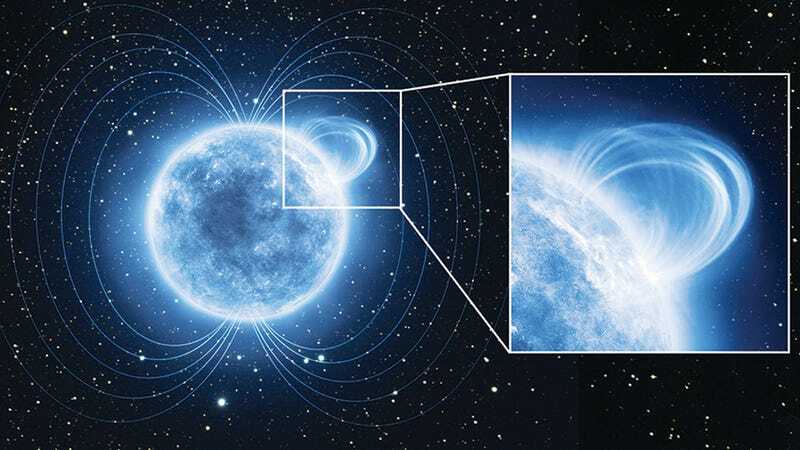 Measuring a mere 12 miles across, the "magnetar" is exerting a force 20 trillion times stronger than a fridge magnet. When astronomers first discovered the dead star in June 2009, which they dubbed SGR 0418+5729, their initial measurements indicated an unusually low magnetic field. But a new analysis performed with the ESA’s XMM-Newton space telescope has shown that the magnetar, a particular kind of neutron star, packs an incredible magnetic punch. Neutron stars are the remains of massive stars that collapsed in on themselves after burning up all their fuel and going supernova. They’re incredibly dense objects, jam-packed with more mass than our sun into a space no larger than a city — about 12 miles across (20 km). Some neutron stars go on to live a brief life as a magnetar. They’re named such on account of their extremely intense magnetic fields, which are billions of times greater than those produced by hospital MRIs. Every once in a while these magnetars erupt with bursts of high-energy radiation. Initial measurements of SGR 0148, which is located about 6,500 light-years from Earth, indicated a magnetic strength of 6x1012 gauss — about 100 times lower than what’s normally observed. As an aside, 'gauss' (rhymes with mouse) is the standard unit used to measure magnetic fields. A typical fridge magnet carries about 50 gauss, and an fMRI machine about 70,000 gauss. The strange and unexpected observation of SGR 0148's weak magnetic field had to do with the way it was measured. Magnetars spin a tad slower than neutron stars, but they can still make a full rotation within a few seconds. Astronomers can determine magnetic strength by measuring the rate at which the spin is declining, but this technique doesn’t allow for the most detailed of measurements. Cosmic Mystery: Why did this spinning star suddenly slow down? But a new technique, one developed by Andrea Tiengo of the Istituto Universitario di Studi Superiori in Pavia, Italy, involves the measurement of variations in the X-ray spectrum of the magnetar over very short time intervals as it rotates. This allows for a much more detailed and accurate analysis — one that has now potentially revealed the largest magnetic field ever observed by science. Using the new technique, SGR 0148 was observed to feature a super-strong, twisted magnetic field reaching 1015 gauss across a tiny region of the surface — a mere few hundred meters across. That’s more than one quadrillion gauss, or 1,000 trillion gauss. Whoa. My advice: If you’ve got magnetic finger implants, don’t even think about going near this thing. Read the entire study at Nature: “A variable absorption feature in the X-ray spectrum of a magnetar.” More at the European Space Agency.